I never understood the so-called "War on Christmas." I mean, I get the concept--one more reason for one set of people to dismiss, mischaracterize, and demonize another side. Fun stuff. Festive. Pass the eggnog. I guess I just don't understand the need to become so invested in it. It's to the point now where part of "making America great again" means that saying "Merry Christmas." That seems to be the sentiment expressed in several letters to the editor lamenting "Happy holidays" as a "politically correct" greeting that compromises the reality of Christmas. One letter writer stated: "It'll still be Christmas Day on Dec. 25, whether you're a Christian or not. 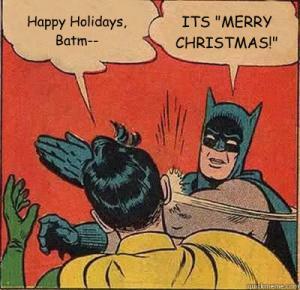 I'll just say Merry Christmas to all. How's that for inclusion?" Not good. Dec. 25 is indeed Christmas, but it is a national holiday as well as a Christian holy day. That is the problem. And the writer's solution neither engages that problem nor, for that matter, expresses the Christmas spirit with such an in-your-face approach. In the first place, the sentiment is lacking in historical perspective. Apparently it bears repeating that Dec. 25 as the Christian festival of the Nativity of Jesus Christ was not popularly celebrated in the West until the 4th century. It is not literally the date of Christ's birth. It was probably selected because of its proximity to Epiphany (Jan. 6), a more important holy day in the ancient church. The fact that Dec. 25 coincides with the winter solstice, a time of celebration in many ancient cultures in the Northern Hemisphere, also may have contributed to the date's designation. It is not the only time one religion has pre-empted an established holy day of another. At any rate, Christmas by the Middle Ages was a popular festival in Western Europe. In the 16th-century Reformation, many Protestants in England and Scotland opposed Christmas celebrations. It certainly was verboten in Colonial New England. It emerged as a major secularized holiday in 19th-century North America, commensurate with Victorian culture and a market economy (Clement Moore's "A Visit from St. Nicholas," 1823, and Dickens' "A Christmas Carol," 1843). The point is that Christmas has its own history of development, and those of us old enough to remember have seen subtle changes in its celebration the past 40 years. In the second place, the sentiment is lacking in political and legal perspective. Once Christmas was legally established as a national holiday, church-state legal and cultural issues followed. The context for understanding the current local issue regarding county sponsorship of a 22-foot-high menorah display is a case in point. Drawing the line between religious and secular symbols has become difficult. In a 1984 case the Supreme Court ruled that state- sponsored Nativity scenes are not religious displays if situated with secular Christmas symbols, reindeer, Santa, snowmen, etc. Interesting. Not only has "Christmas" long been expanding beyond Christian-specific symbols, but also it has expanded and modified the meaning of quite specific Christian symbols! Christmas, finally, is not the only religious holiday that occurs this time of year. And the idea that the United States is a Christian nation, not to say a de facto Protestant establishment, has not been serviceable for some time now. In our increasingly pluralist society, to emphasize Christianity in any "establishment" connotation is culturally, legally and politically incorrect. I grow weary of accusations of political correctness by social and religious conservatives. "Politically correct" doesn't necessarily have a negative ring for me. If by political correctness one means that only certain thoughts or opinions are permissible, then I agree with rejecting the idea. But if it means honoring people by calling them what they wish to be called, not offending others by the way we speak regarding matters of gender, sexual preference, ethnic or racial identity and religious belief, then I don't mind the label. Our family does Christmas from the first Sunday in Advent to Epiphany (when the grandchildren put the Wise Men in the Nativity scene and we sing carols for the last time). But unless I know that the person I'm addressing is Christian, I greet that person with "Happy holidays" or "Season's greetings." It's polite, by damn!